This season began on March 31 on the road. Now, the Phillies are on their second-last road trip of the season as September begins on Monday, the unofficial end of summer. Fresh from a 7-2 homestand against three top-ranked teams, the Phillies are spending this weekend in New York’s Citi Field. The Mets hold a commanding 10-5 edge over the Phillies in the season series, although the two clubs are 3-3 in NY. In the standings, the Mets have a .5 lead over the Phillies. Earlier in the season, the Phillies were better on the road and struggled at home. That trend has reversed itself. 4: Phillies winning streak, longest in the majors currently. Lehigh Valley lost, 8-5, to Pawtucket. 2B Cesar Hernandez, 4 AB, 1B, 1B, 2B, 3B. LF Cam Perkins, 3 hits . . . Season ends Monday in Scranton. Reading won last home game, 3-1, at Portland; third straight win. 2B Carlos Alonzo, 2 H, 2 RBI. WP: Hoby Milner (10-6), despite walking 5 in 6 IP . . . Season ends Monday in Trenton. Clearwater lost the final home game, 8-2, vs. Tampa . . . Weekend series in Lakeland ends the season. Lakewood won, 3-0, over Hickory in final home game. WP: Yoel Mecias (3-3). 1B Willians Astudillo, 3 H . . . Season ends Monday in Hagerstown. Williamsport lost, 1-0, at State College. LP: Ricardo Pinto (1-5), 7 IP, 3 H, 1 R, 1 ER, 3 BB, 9 SO . . . Season ends Monday at home against State College. Gulf Coast League Phillies won, 5-3, over the Yankees1 in the season’s final game. Phillies finished 1.5 games behind Yankees1. 2 H, 2 RBI: RF Gustavo Martinez; LF Olvy Marte. WP: Franklyn Kilome (3-1). Florida Instructional League: Program begins September 15, at Carpenter Field. Arizona Fall League: CF Ramon Quinn, C Logan Moore, RHP Colton Murray, RHP Nefi Ogando and LHP Ethan Stewart will be on the Scottsdale Scorpions along with LV pitching coach, Ray Burris. One more Phillies minor leaguer will be assigned to the roster. RHP Charlie Ferguson tosses the first no-hitter in Phillies history, 1-0, vs. Providence. 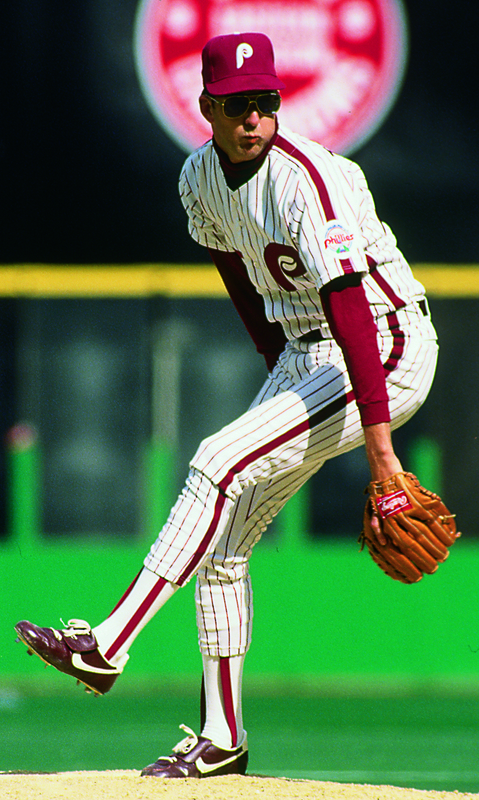 In his four-year career, all with the Phillies, he finished 99-64, 2.67 ERA winning 21-26-30-22 games. He died of typhoid fever two weeks after his 25th birthday. **Saturday, September 13, Barnes & Noble, 2300 Chemical Road, Plymouth Meeting, PA 19462, 12 noon to 2:00 p.m. This Monday, 6-7 p.m. with Greg Luzinski and Dan Baker on WBCB Radio and http://www.WBCB.com. Live “Bull Session” show takes place at Chickie’s & Pete’s on Roosevelt Boulevard in northeast Philly. Hope you can join us. Yes, will have books if anyone wants to buy one. Going up against three teams in the playoff hunt, the Phillies polished off a 7-2 homestand last night in sweeping the Nationals, the first against them at Citizens Bank Park in two years. KK once again was tagged for two quick runs in the first inning, re-grouped, the offense came alive with three home runs as the Phillies improved to 14-6 in their last 20 home games. One of the homers was the first ever pinch-hit HR for Grady. It was the fifth of the season for the Phillies. The club’s single-season record of 11 in 1958 is safe for another year. Ryan had three hits while Chase and J-Roll had two hits each. It was the 40th time that Howard, Utley and Rollins all had at least two hits in the same game since the trio started playing together in 2004. The Phillies are 34-6 in those 40 games. 10-5:	Phillies record on Thursday, their best day of the week. But, today is a day off. They’ll board some buses for a journey north to begin a weekend series against the Mets tomorrow night. Player – 3B/1B Maikel Franco, Lehigh Valley … 7 G … Batted .500 (14-28), .500 OBP, .893 SLG, 6 R, 3 2B, 3B, 2 HR, 5 RBI … Franco hit for the cycle in his first four at-bats in Game 2 of the IronPigs doubleheader against the Syracuse Chiefs … He doubled in the 1st inning, tripled in the 3rd, singled in the 4th, and hit a solo home run in the 6th, becoming just the second IronPig in franchise history to hit for the cycle … The 22-year-old finished the day 6-for-7 with a double, triple, 2 HR, 4 RBI, and 4 runs scored in the doubleheader … Signed as an amateur free agent on January 13, 2010, by Koby Perez. Pitcher – RHP, Ricardo Pinto, Williamsport … 1 G, 0-1, 1.50 ERA (6.0 IP), 0 BB, 6 H, 1 ER, 9 SO … In 8 games this season the 20-year-old has posted a 2.25 ERA (10 ER, 40.0 IP) … The 6-foot righty began his pro career in 2012 with VSL Phillies … A native of Venezuela, Pinto was signed by the Phillies as an amateur free agent in 2011 by Jesus Mendez. Lehigh Valley won, 5-1, over Pawtucket. 3B Maikel Franco, 2 H, 2 RBI. CF Tony Gwynn Jr., 3 hits, including first HR. WP: Greg Smith (9-10). Reading won, 5-2, at Portland. HRs: DH Jake Fox (22), C Logan Moore (4). WP: Adam Loewen (3-5); SV. Nefi Ogando (7). Clearwater won, 9-7, in 11 innings at Tampa. RF Brandon Short, 2 H, 3 RBI. WP: Ulises Joaquin (2-1), 3 IP, 2 H, 1 BB, 4 SO. Lakewood lost, 3-2, to Hickory, getting only 4 hits. 3B Mitch Walding, 7th HR. Williamsport lost, 6-0, at State College. Gulf Coast League Phillies won, 3-0, at the Pirates but were eliminated from the postseason when the Yankees1 won a doubleheader. Final game of the season at 12 noon today, Pirates at Carpenter Field. Paul Hagen found Steve Jeltz, former Phillies shortstop. Click on http://www.phillies.com/alumni to learn about Steve’s life away from the game and his greatest game. **This evening, back in my hometown, Community Library, 199 N. College Street, Myerstown, PA; 5-7:30 p.m. This Monday, 6-7 p.m. with Greg Luzinski and Dan Baker on WBCB Radio and http://www.WBCB.com. Live “Bull Session” show takes place at Chickie’s & Pete’s on Roosevelt Boulevard in northeast Philly. Will bring some books for those who want to buy one and have it personally autographed. Hope you can join us. A bang-bang play at first was ruled an out but following a replay review, Ben was ruled safe. He went on to score the decisive run in the eighth inning of a 4-3 win over the Nationals last night. Thus, the Phillies won their third straight series for the first time since July of last year. Cole saw a 3-0 lead slip into his 11th no decision. The Phillies are 5-6 in those decisions. He’s now allowed three earned runs or less in each of his last 17 starts (6-3 record). His ERA is 1.90 since June 1, fourth best in the majors. Pap picked up his 100th save as a Phillie matching Brad Lidge for fourth place on the club-s all-time list. His percentage (87.7%) is the highest for any closer in Phillies history (minimum 100 save opportunities). From Elias Sports Bureau: Papelbon is the first player in major-league history with at least 200 saves with a team in one league (219, Red Sox) and 100 or more saves for a team in the other league. 4:	Triples for Sizemore, his most since the 2009 season. Lehigh Valley won, 5-4, over Syracuse. 3B Maikel Franco’s 16th HR was a grand slam. He’s hit 4 HR in last 5 G. WP: Sean O’Sullivan (6-10); SV: Luis Garcia (21). Reading won, 4-1, at Portland. SS KC Serna, 3 hits. WP: Ryan O’Sullivan (6-8), 7 IP, 6 H, 1 BB, 6 SO. Clearwater lost, 6-2, at Tampa. RF Brian Pointer, 2 of their 4 hits. Lakewood lost, 6-2, to Hickory. RF Dylan Cozens, 16th HR. Williamsport won, 8-1, at Batavia. CF Jiandido Tromp, 3 hits, SB. 6 others had 2 hits each. WP: Feliberto Sanchez (3-8). Gulf Coast League Phillies won, 3-1, over the Yankees1, scoring all runs in the top of the ninth. CF Carlos Duran, 2 2B, single, RBI, 9th SB. WP: Josh Taylor (2-0), 4 IP, 3 H, 1 BB, 7 SO. Victory moved the Phillies to within 1 game of the Yankees1 club in the Northwest Division. 4 Division winners advance to the playoffs. Phillies have 2 games left, today and tomorrow vs. the Pirates. The Taney Dragons, the first team from Philadelphia to reach the Little League World Series, will be honored pre-game today at Citizens Bank Park. Ceremonies begin at 7 p.m. with the game to follow. **This Thursday (August 28), Community Library, 199 N. College Street, Myerstown, PA; 5-7:30 p.m. This Monday, 6-7 p.m. with Greg Luzinski and Dan Baker on WBCB Radio and http://www.WBCB.com. Live “Bull Session” show takes place at Chickie’s & Pete’s on Roosevelt Boulevard in northeast Philly. Hope you can join us. A.J. totally reversed his last start in beating the Nationals last night, 3-2. In his previous start, he began with eight straight pitches out of the strike zone. Last night, he retired the first eight batters, five on strikeouts. It was his first win since July 11 when he beat the Nationals. Win last night ended a personal six-game losing streak. He finished with a season-high 12 strikeouts, two shy of his career best. From Elias Sports Bureau: Burnett is the first pitcher in major-league history to have a 12-strikeout game for five different teams. He’s 11-5 in his career vs. Washington. Lehigh Valley lost, 5-3, to Syracuse, getting 5 hits, one being the 15th HR for 3B Maikel Franco, 3rd HR in the last 4 games. Reading was shutout, 3-0, at Portland, getting 7 hits, 6 being singles. Williamsport lost, 3-0, at Batavia, getting 7 singles. Gulf Coast League Phillies lost, 7-1, to Yankees1 falling behind them by 2 games with 3 left on the schedule. CF Gustavo Martinez, 2 of Phillies 5 hits. RF Bobby Abreu hits his third grand slam of the year — the sixth of his career — to help the Phillies beat Arizona 11-3. Three other Phillies hit at least three slams in a season, the previous being Gene Freese in 1959. (Courtesy broadandpattison.com). Check out http://www.phillies.com/alumni for another in the series of great moments in the history of Citizens Bank Park. Seasons 2010 and 2011 are included in this series. The Taney Dragons, the first team from Philadelphia to reach the Little League World Series, will be honored pre-game Wednesday a Citizens Bank Park. Ceremonies begin at 7 p.m. with the game to follow. Oops, not those type of notes. But baseball notes from the weekend when Phillies took two of three from St. Louis. Warning: some of the notes may classify as oddities. **Phillies won back-to-back series for the first time since late April. **Cardinals haven’t won a series at Citizens Bank Park since 2006. **KK had another nightmarish first inning on Friday, settled down and started a game-decisive, four-run fourth with a single. **Howard hit a home run Saturday off a right-handed pitcher for the first time since June 19…..the same pitcher (Miller) in a game in St. Louis. **For the fourth straight Saturday at home, the Phillies went into extra innings (12-11-10-10) and lost, for the fourth straight time. Fifth previous Saturday was a double-header (two losses) so if you want to see bonus baseball, go to a Phillies Saturday game at Citizens Bank Park. Warning: there are only two more left on the schedule. 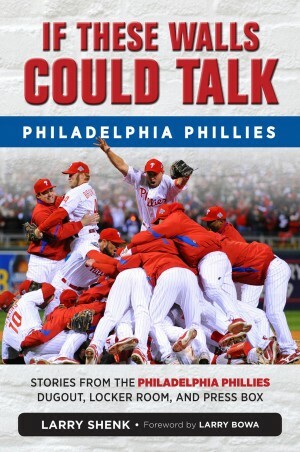 **Last time the Phillies won a Saturday home game, June 14, 7-4, over the Cubs….this year. **As the result of Saturday’s game, the Phillies have played 49 extra innings, third most in the majors. **Phillies used four different first basemen in the game, including Chase, his first at first since 2003. **J-Roll stole two bases in the game, becoming just the eighth player in baseball history with at least 800 extra-base hits and 450 steals. **Jerome gave the bullpen much needed rest with a strong eight-inning outing on Sunday, the first time he’s gone that far since 2003. He gave up one run and drove in one….a safety suicide squeeze. According to Elias Sports Bureau, it was his second RBI of his major-league career and first since his rookie season of 2003. The gap of 4000 days between Williams’ first and second career RBIs is the longest of that kind in major-league history. Now, there’s a true oddity! **After hitting seven home run in July (tied for second in NL), J-Roll got his first this month in Sunday’s win. **Ben had two hits Sunday, his 45th multi-hit game of the season, to move into a tie for the NL batting title race with the Rockies’ Justin Morneau, .314. **Phillies are 4-1 on this home stand against two hot teams, Seattle and St. Louis. Starting tonight, three night games with the Nationals, the majors’ hottest team, winning 11 of last 12. Washington is dominating the NL: biggest lead (8 games), most wins (75), most wins at home (43) and have out-scored their opponents by the most runs (107). On the road the Nats are a bit more humane, 32-29. 88:	Strikeouts by Jake Diekman, most for any NL reliever. Lehigh Valley won 3 of 4 games. 3B Maikel Franco, 10-16, 2 HR, 5 RBI, 6 R; hit for cycle in Saturday’s second game. Average increased, .243 to .256. Winners: Hector Neris (4-2), 5 strikeouts out of 7 outs; Tyler Knigge (3-3), Jason Marquis (2-1). SV: Luis Garcia (20). Reading ended home schedule by taking 2 of 3 from Erie. 2B Carlos Alonso, 5-13, HR, 6 RBI. Winners: Kyle Simon (5-2), Hoby Milner (9-6). Peter Lavin’s walk-off single won Friday’s game in the 12th inning. No decision Sunday for Aaron Nola, 5 IP, 4 H, 1 R, 1 BB, 5 SO. Clearwater lost 3 of 4 at home to Brevard County. DH/1B Art Charles, 6 H, 3 HR (19 for season), 5 RBI. SS J.P. Crawford, 2 HR Sunday. CF Roman Quinn, 30th steal on Saturday, his 83rd game. Lakewood won 1 of 3 vs. Greensboro at home. Win was 4-0 on Friday, Yacksel Rios (6-1), 6 IP, 6 H, 4 SO. RF Dyan Cozens, 15th HR Saturday. Williamsport lost 2 of 3 at Auburn. 1B Rhys Hoskins, 8th HR in Saturday’s 4-3 win. Losses were both shutouts, 4-0, 8-0. Gulf Coast League Phillies beat Toronto twice, 8-3, 2-1. Winners: Josh Taylor and Jared Fisher. Phillies trail Yankees1 by 1 game with 4 games left on the schedule in the Northwest Division. Two teams meet today (Clearwater) and tomorrow (Tampa). Last 2 games are against the Pirates. Before a double header with St. Louis, the Phillies honored Del Ennis for driving in more runs than any player in team history. Ennis was presented with gifts including a Cadillac, TV, air conditioner, freezer, diamond ring, and fishing outfit. The Phils won both games, with Ennis adding 4 RBI to his record total. (Courtesy broadandpattison.com). Today: RHP Mike Welch (42), OF Doug Glanville (44), C Choo-Choo Coleman (77) . . . Tuesday: INF Jayson Nix (32), RHP Geoff Geary (38), RHP Ricky Bottalico (45), RHP Jeff Parrett (53), RHP Fred Wenz (73), CH Billy DeMars (89) . . . Wednesday: 1B Jim Thome (44), RHP Mike Maddux (53), RHP Don Grate (91) . . . Thursday: RHP Ryan Madson (34), OF Billy Cowan (76), OF Tony Gonzalez (78) . . . Friday: OF Aaron Rowand (37), RHP Roy Oswalt (37) . . . Saturday: RHP Renie Martin (59) . . . Sunday: OF Von Hayes (56), C Bill Nahnorodny (61). Three games each with the Cardinals (this weekend) and Nationals (starting on Monday night) close out baseball at Citizens Bank Park for August. The curtain comes down on the month with three games in New York next weekend. Next month finds the Phillies at home for 10 games and on the road for 16, including their third trip to California. For the Phillies, it is a chance to be the spoiler as only four games are against a team not in the postseason hunt. Those four are in San Diego, where, as of this morning, the Padres were 8 games out of a wildcard berth with six teams ahead of them. The Phillies were 11.5 games out with eight teams ahead of them. 77: RBI by Howard, tied for fourth in the NL. 27 have come off LHP, most in the league. Lehigh Valley lost third in a row, 3-2, at Pawtucket. C Cameron Rupp had 3 of LV’s 5 hits. HR: CF Tyler Henson (7) . . . Season ends Labor Day. Reading lost, 6-2, at Bowie. RF Peter Lavin, 2 of Reading’s 6 hits . . . Reading opens final home series tonight vs. Erie . . . Season ends Labor Day. Clearwater lost, 5-4, at Daytona. C Gabriel Lino, HR (4), 4 RBI . . . Season ends August 31. Lakewood rained out at West Virginia . . . Season ends Labor Day. Williamsport won, 2-1, on 2B Robinson Torres’ walk-off single . . . Season ends Labor Day. Gulf Coast League Phillies lost to the Braves for the second straight day, 7-3. Fell 2 games behind the Yankees with 6 games remaining . . . Season ends August 28. **Thursday, August 28, Community Library, 199 N. College Street, Myerstown, PA; 5-7:30 p.m.
Way too often this season, Cole would pitch brilliantly and not pick up a win. Yesterday, he wasn’t as sharp as he’s been but did get the W, thanks to brilliant relief pitching. Jake, Ken and Pap completely closed the door on the Mariners. They combined for four shutout innings. Nine of the 12 outs came on strikeouts. The Phillies took two of three, the first time they’ve ever won a series against Seattle. St. Louis starts a weekend series on Friday night. Monday baseball’s hottest team, the Nationals, come to town for three night games. 7: Wins for Cole, tops on the staff. Lehigh Valley lost, 9-0, at Pawtucket, getting only four hits. Reading lost, 8-0, at Bowie. RF Kelly Dugan, 2 doubles, 2 RBI. Clearwater won, 7-3, at Daytona. CF Ramon Quinn, 1B, 2B, HR (6), 4 RBI. 1B Art Charles, 16th HR. WP: Mark Leiter Jr. (3-4). Threshers have won 5 of last 6 games. Lakewood lost, 5-1, at West Virginia, getting 6 hits, 2 by C Willians Astudillo. Williamsport lost, 9-1, to Mahoning Valley, on 4 hits, one a HR by CF Jiandido Tromp (13). Gulf Coast League Phillies lost, 4-0, to Houston. C Joel Fisher’s one-out single in the eighth was Phillies lone hit. Hard to believe in the last 10 starts by A.J. and Cole, the Phillies are 1-9 with neither picking up that one win. A.J.’s streak reached six straight defeats since his last win on July 11. Seattle evened the series last night, 5-2. Phillies offense consisted of two runs in the ninth—one of a wild pitch—and six total hits, four singles, two doubles. Until that ninth, three Phillies reached second base, Howard on a fourth-inning double and two ground crew members who changed a wobbly second base bag in the top of the seventh. Cole is 0-1 with two no decisions in three starts this month. He goes this afternoon as the Phillies try to win a season series from the Mariners for the first time ever. He’ll have to do it against a pitcher who is 6-0 in nine major league starts and on a woeful Wednesday (5-13) for the Phillies. 0: Runs Iwakuma has yielded in three career starts in National League ballparks, a total of 22.0 scoreless innings, including eight last night. Player: OF Aaron Brown, Lakewood … 4 G, .563 average (9-16), .556 OBP, 2 R, 3 2B, 2 RBI, BB. Promoted from Williamsport to Lakewood on 8/14 and posted organization-best 1.306 OPS over his first 4 games with the BlueClaws. Selected in the third round this year out of Pepperdine University, Brown was signed by Shane Bowers. Pitcher: LHP Hoby Milner, Reading … 1 G, 1-0, 0.00 ERA, 9 IP, 3 H, 0 BB, 5 SO vs. Binghamton on 8/17. Selected out of the University of Texas in the seventh round in 2012; signed by Steve Cohen. Lehigh Valley lost, 7-0, at Pawtucket despite getting 10 hits. RF John Mayberry Jr., 2-4; 3B Maikel Franco, 3-4. Reading gave up 6 runs in the bottom of the eighth in losing, 8-6, at Bowie. No decision, RHP Aaron Nola, 5 IP, 5 H, 2 R, 2 BB, 2 SO. Clearwater split a pair at Daytona, 5-2 and 3-4. HR: 1B Art Charles (15), RF Brian Pointer (14). 2B Jesmuel Valentin made his debut, 1-7, with a SB. Lakewood was rained out in West Virginia. Williamsport is on a two-day, All-Star Game break. All-Stars are RHP David Whitehead, RHP Mitch Gueller, OF Jiandido Tromp and INF Derek Campbell. Gulf Coast League Phillies beat Houston, 5-1. CF Venn Biter, 2 H, 3 RBI. WP: Elniery Garcia (2-1), 6 IP, 2 H, 0 R, 1 BB, 5 SO. Phillies have won 16 of their last 19 games. Victory moved them into a tie for first place in the Northwest Division with 8 games remaining on the schedule. Well, chalk up some “firsts” for Jerome and Andres as the Phillies won their fourth straight interleague game last night at Citizens Bank Park, 4-1, over the Mariners. For Jerome, his first interleague win in 10 years (at Baltimore), a span of 3,718 days and a 0-6 record. Since last August 16, 2013, he’s 6-2 as a starter. For Andres, subbing at shortstop, a game-deciding three-run homer. His first HR since July 1, 2011 vs. Florida, a span of 1,145 days, but only 48 at-bats. For his career of 621 at-bats in the bigs, he’s hit four home runs. Jerome walked three, all leading off an inning but none scored. The Phillies drew seven walks and three scored. Game two tonight, A.J. trying to break a five-game losing streak against Iwakuma, 3-1, 1.27 in his last four starts. Chances are Phillies won’t be drawing many walks as he’s given up just 12 in 139 innings. Rollins has hit 214 home runs, 212 have come while he was playing shortstop. Since 2001 when he hit his first, only six shortstops other than Rolling have homered for the Phillies: Tomas Perez (5), Wilson Valdez (3), Freddy Galvis (3), Eric Bruntlett (2), Nick Punto (1) and now Blanco. 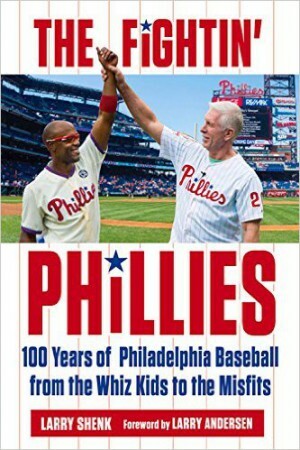 300: Number of interleague games the Phillies have played. Lehigh Valley, Reading and Lakewood were not scheduled. Williamsport is off for a two-day All-Star Game break. Clearwater was rained out in Daytona. Gulf Coast League Phillies lost, 7-2, at the Astros, getting 3 singles and one double. Starting in spring training and ending last week, I visited five minor league ballparks as part of a book-signing tour. Naturally, something to eat was high on my tummy’s itinerary. Clearwater (Bright House Field): Strawberry sundae. I know, I know, a sundae is more of a dessert than dinner. Don’t be picky. It is sooo good. Can’t wait for next March. In protest, will not have any other strawberry sundae until then. Reading (FirstEnergy Stadium): Hot dog and French fries. Dogs are grilled, not boiled and that makes the difference. Only a vision of my doctor glaring over my right shoulder kept me from having two dogs. Wilmington (Frawley Stadium): Grotto’s pizza. Having moved from Delaware to Pennsylvania a year ago, couldn’t want to have a slice or two (three, really) of my favorite Delaware pizza. Allentown (Coca-Cola Park): Hmmm, corn on the cob. About to head there when I saw another menu: Three-pig sandwich. Only at a place where the IronPigs play ball could there be a sandwich with that name. It was large and good: ham, bacon and pulled park. Don’t tell the doctor. Lakewood (FirstEnergy Park): Autograph table was located behind home plate, the field behind me and a grille staring at me. Fans were lined up at it and also a pulled pork/mac and cheese adjacent stand. Difficult incision. Watching an intern slowly grilling burgers made the decision. Result: best hamburger I’ve ever eaten. Minor league ballparks are fun and filled with food options for any taste. Phillies have nine consecutive postponements, August 10-19. For the second time in the last three weekends, the Phillies won the first game of a weekend series but dropped the next two. This time in San Francisco. Lost opportunities by the offense was the main culprit. The Phillies were 4-18 with runners in scoring position in those losses, leaving 21 men on base. Lincecum threw 76 pitches in three innings Sunday but all the Phillies could muster was two runs, one coming on a bases-loaded walk. A error also paved the way for the lead run in each of the last two games. What do these numbers represent? 9 innings, 5 hits, 0 runs, 2 walks, 13 strikeouts. The Giants bullpen over their two wins. Nine of the 12 outs by SF relievers on Sunday were punch outs. The red-hot Mariners (8-2 in last 10 games) come to town for three games starting tonight, first visit to Citizens Bank Park and second time in Philly. The other time was a three-game sweep at the Vet 11 years ago. In interleague play, the Phillies are 2-7 against Seattle. If the season ended today, Seattle and the Angels would be in as the wildcard entries. Detroit wouldn’t. Mariners have the AL’s lowest ERA, starters, relievers and overall. They have allowed two or fewer runs 55 times, best in the majors. 314: Ben’s batting average, which ranks second in the NL to Justin Morneau’s .323. 7 hits in last 10 at-bats boosted Ben’s average to #2. Lehigh Valley scored 3 runs with 2 out in the last of the ninth for a 3-2 win against Buffalo. SS Freddy Galvis drove in the first run; 1B Maikel Franco hit a walk-off homer (#12). Win snapped a 5-game losing streak that included 7-1 and 5-0 decisions, getting just 10 total hits in Friday and Saturday games. Reading won, 1-0, yesterday behind LHP Hoby Milner’s 3-hit complete game. Binghamton had won the first 3 games of the series. LHP Jesse Biddle returned to AA on Saturday night and left in the fourth inning with a strained right quad. CF Aaron Altherr hit 24th HR, 5 in last 10 games. Clearwater completed a 3-game sweep at home against Lakewood, 5-2, 7-5 and 10-1 Sunday, a game in which SS J.P. Crawford had 3 hits and 3B Harold Martinez hit his 6th HR and drove in 4. CF Roman Quinn, base-running trifecta, 28th SB, CS, PO at first base. Lakewood won 2 of 3 from Hagerstown. C-1B Willians Astudillo, 8-11 in 3 games; C Andrew Knapp, 6-9, in 2 games. RF Aaron Brown, promoted from Williamsport on Thursday, 9-16 in his first 4 games. Williamsport won 2 of 3 at Mahoning Valley. 3B-2B Derek Campbell, 6-11. WPs: Dave Whitehead (4-3) on Friday; Brandon Leibrandt (2-2) on Sunday; lowered ERA to 1.75. Gulf Coast League Phillies won 5-0 at Detroit and had 2 other games postponed. WP: Sam McWilliams (3-2), 5 innings, 3 hits, 2 strikeouts. are unearned. Attendance for the Monday doubleheader was 2,873.
one game. SS Ralph Miller and P Lee Meadows did it 76 years ago, April 28, 1921.
games caught. Phillies drop 6-4 decision to Washington.